This entry was posted on September 19, 2017 by Mark Hutchby. Scratch Designs opened September 18th 2007. September 18, 2007 we opened the doors to the public for the 1st time. Being immensely proud of being back in the family building. The locals took us to heart straightaway. 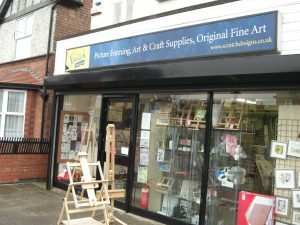 Scratch designs very quickly built its reputation for its bespoke picture framing offering quality and speed service at sensible prices, attracting artists in with a great selection of artists products. Scratch designs sell successively across many online channels building a reputation for honesty and fairness and good customer service . In 2013 the decision was made to build a new online shop that would make buying art supplies simple easy and affordable. Putting the artist 1st. We had Andrew Burdett from Andrew Burdett designs who took our brief design and make a new website. With Andrew Burdett's expertise in marketing we took on board his suggestion of a rebranding of the company name to make it more Internet friendly. We hit upon the name of local art shop. We launched the www.localartshop.co.uk at the end of 2013. Getting a reputation very quickly for its ease of use simplicity of finding items and the range of products available. Focusing more on best quality items for the price points rather than just a brand names, local art shop by artists for artists. Building on our reputation and understanding of products we came out with our own brand of artist pads. Local art pad which are made by selecting only papers made in UK paper mills. Which we consider the best for that medium. Starting off with drawing pads selling through our 1st delivery in space of 2 months. We have extended the range now offering multiple different watercolour papers, mixed media, Museum grey and of course drawing pads, mostly in large spiral-bound with plenty of paper. Including our bespoke botanical paper which is loved by professional artists. The super proud of how well they have done. Over the Christmas break 2016 we had a full refit in our shop, extending the shop even more which has made even more poignant our success in this our 10th year. Thank you for your business and your support. Follow us Facebook and sign up to our newsletter the latest deals are happening is now shop.